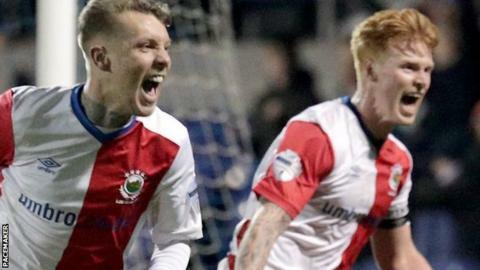 An injury-time goal from Chris Casement gave Linfield a dramatic win over Newry City and maintained their nine-point lead over Ballymena United. The defender headed home in the 92nd minute to make it 10 Premiership wins in a row for David Healy's men. Ballymena United had looked to have narrowed the gap at the top to seven points by beating Cliftonville 2-1 at the Showgrounds. Glentoran moved up to eighth with a 3-1 home win over 10-man Warrenpoint Town. Casement's late winner for the Blues came from a Niall Quinn cross, with the former Portadown defender rising at the back post to head home. It was a first half of few chances at the Showgrounds, although visiting defender Mark Stafford, standing in for the suspended Jimmy Callacher, headed against the bar when he should have scored. Linfield took control on the restart but wasted a series of openings - Stafford was twice off-target with close-range headers while Ryan McGivern volleyed wide. Andy Waterworth had thought he had given Linfield the lead early in the second half, but his header at the near post was ruled out for offside. The south Belfast outfit now have eight league games to play, while the Sky Blues have nine matches remaining. Both the previous league encounters between Ballymena and Cliftonville this season had ended with one-goal victories in favour of the home sides and it was David Jeffrey's men who repeated their 2-1 success over the Reds at the Showgrounds in November to keep up their pursuit of leaders Linfield. Ballymena bossed the first half and Richard Brush did well to acrobatically push Leroy Millar's header from a Steven McCullough free-kick onto the bar. Cathair Friel took one touch with one foot before firing home with the other after the ball was played into him in the 20th minute but the hosts' lead should have been greater than just a solitary goal at the interval. Cliftonville came out with renewed intent after the break but found themselves 2-0 down after 72 minutes when Millar executed a deft turn and lob over Brush. A minute later substitute Rory Donnelly headed home unchallenged from a corner but despite piling on the pressure late on the Reds were unable to fashion an equaliser, with Chris Curran firing wide. The Sky Blues had opportunities to extend their lead too but Brush distinguished himself with fine saves from Jude Winchester and Jim Ervin. Glentoran took the lead against the run of play at the Oval when Robbie McDaid finished well into the bottom corner after his first effort from a Marcus Kane cross was blocked. Darren Murray doubled the lead with a penalty four minutes before half-time after McDaid was fouled and Murray hit his second with a fine lob three minutes after the break. Kane then turned one into his own net just after the hour before Town's Lee Duffy was sent off for a second yellow card.